Gun tattoos are a lot of fun, and the creativity better than I thought when I started looking for them as a possibility for a tattoo design. Of course this could have went in a lot of directions other then simply showing guns as tattoos. But I did keep that as the main theme for the most part in this article even though some tattoos with guns tell a story, while others give a unique look and twist which adds some real character to the overall tattoo. Even so, I wanted to showcase the guns and not be distracted with the rest. 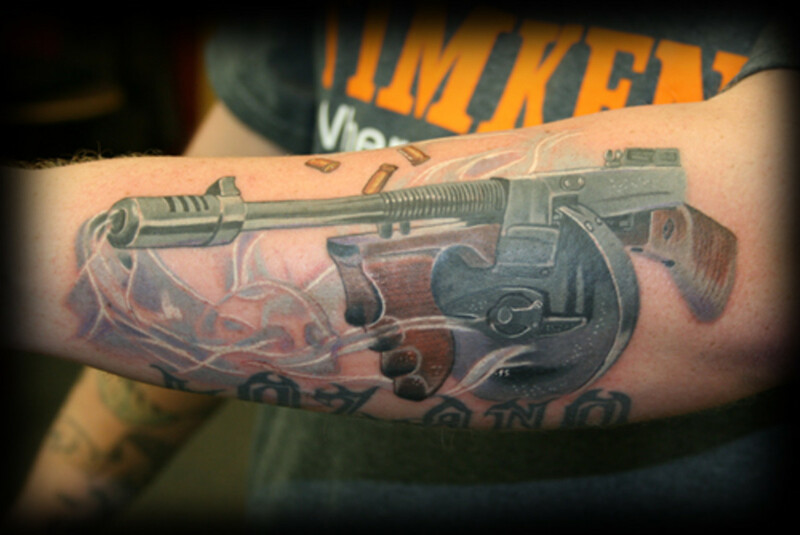 There were also a variety of guns represented with the tattoos. Most of them are more historical, which is understandable from the point of view of inking something cool on your skin for all to see. Showing a modern day gun wouldn't quite give you what these more unique, vintage guns give you, and I'm sure that's what most people thought of when getting these gun tattoos. 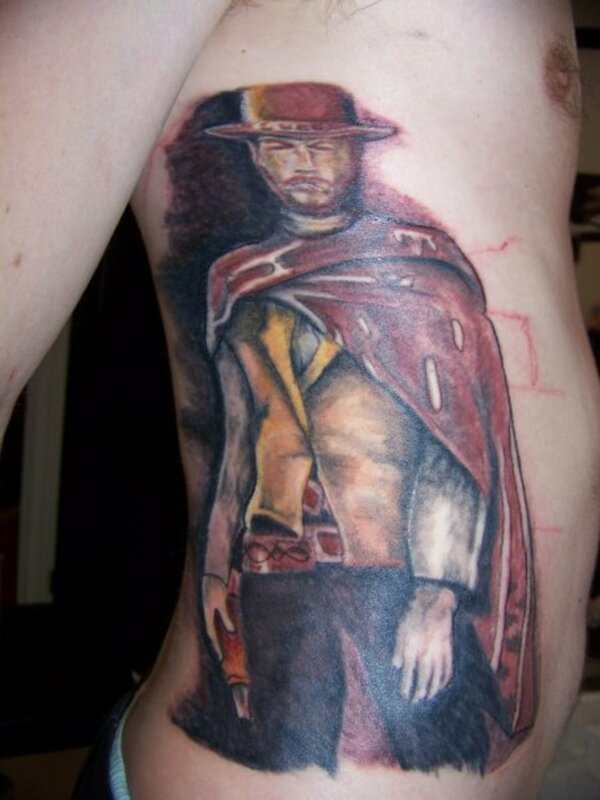 I had to start with this tattoo of Clint Eastwood from the Good, The Bad, and the Ugly. You can almost hear the music from the show in the background when you look at this tattoo. You can feel him about to reach for his gun in a well done tattoo design. 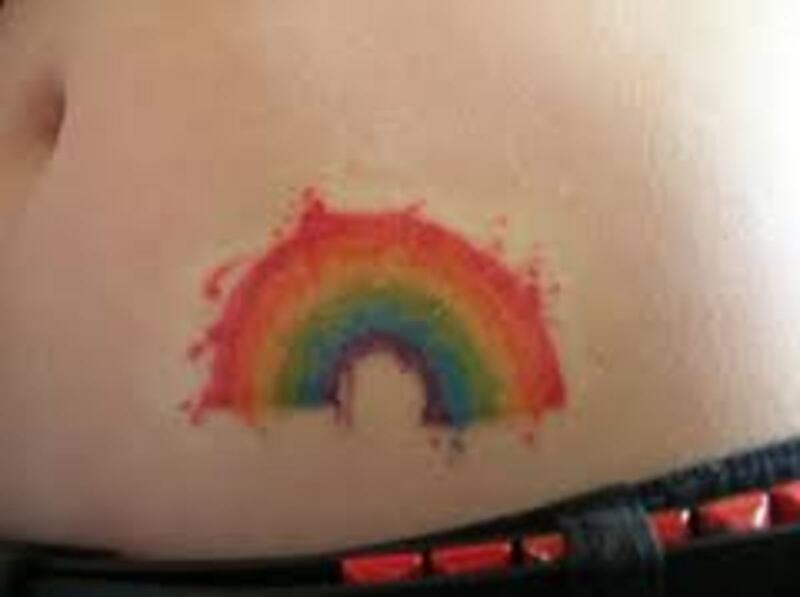 It sets the tone for the rest of the tattoo gun gallery we're about to look at. 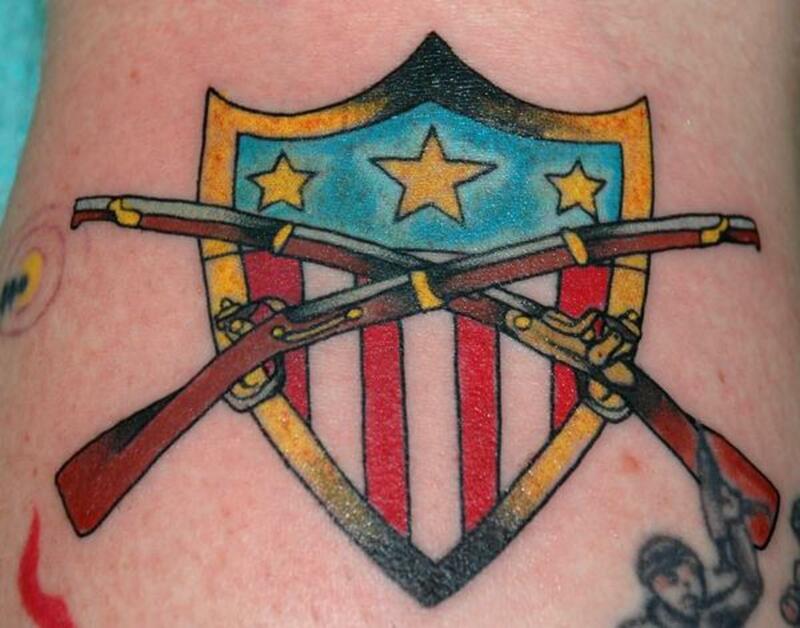 This tattoo of the crossed flintlock rifles is very cool, and obviously an insignia. The tattoo itself is very clean, and seems to represent a group of soldiers in a battle which isn't able to be made out in the photo, but seems to be World War II, based on the gun in the soldier's hand. That doesn't mean the flintlocks were used during that war, as obviously they weren't. I'm just saying the symbol may represent a particular unit in a battle, or a battle itself. 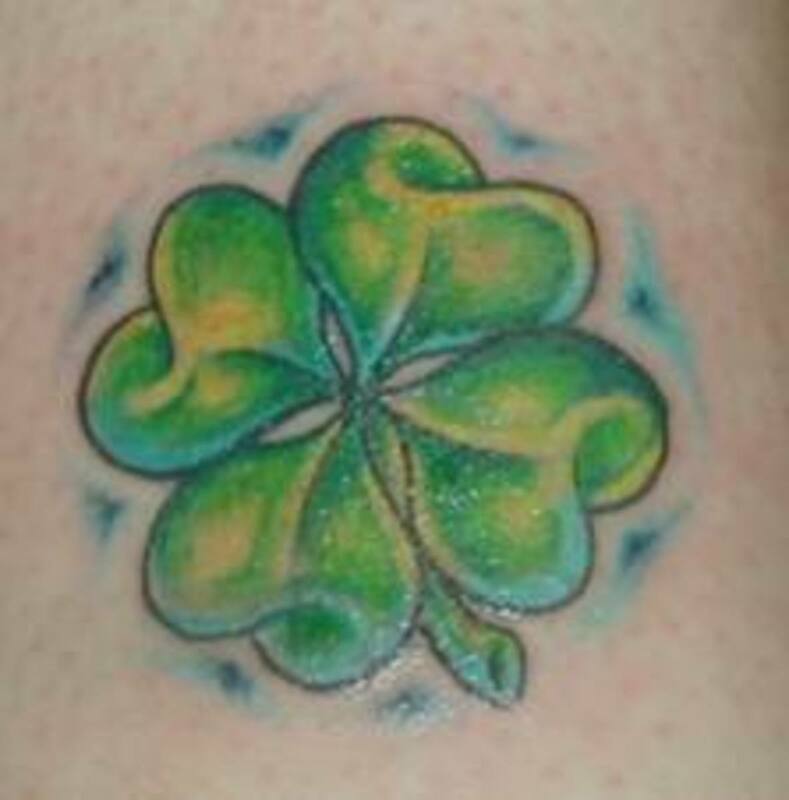 It could also be it is a second tattoo beneath the flintlock image and unrelated to it.. 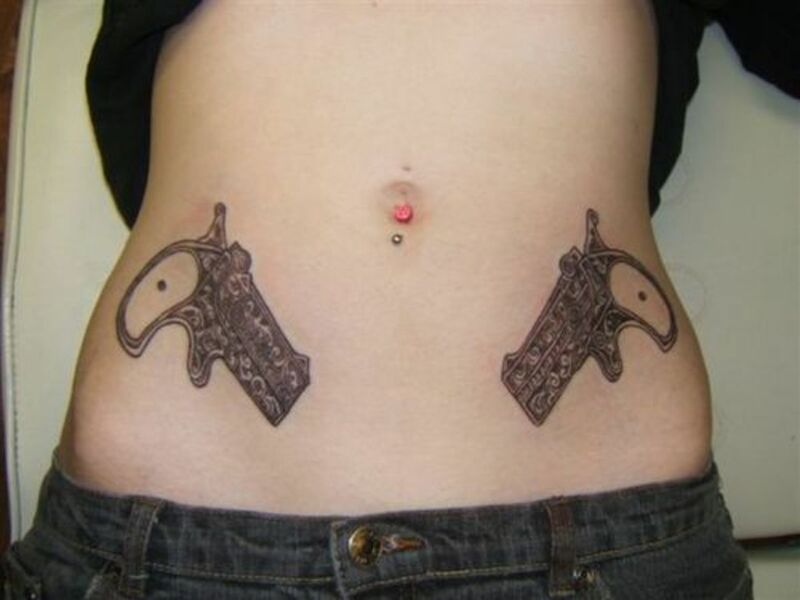 Among the several more popular gun tattoos stands the Derringer, and maybe because of its smaller size, the ladies liked this one a lot. The two on the hips below are very cool, and I could imagine what happens whenever she goes out in her bikini wearing the two miniature pistols. She's either getting a lot of stares from strangers or comments from friends. 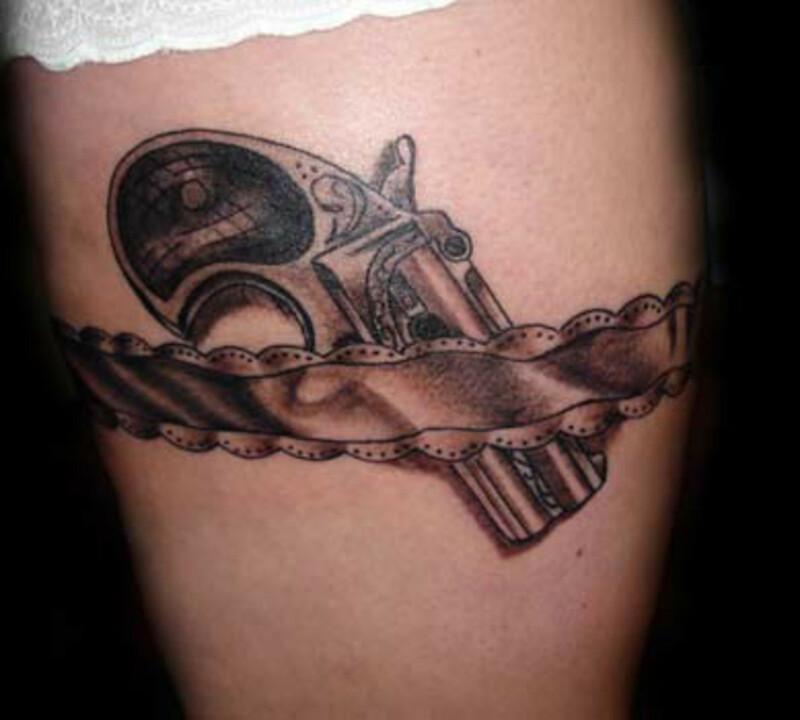 I thought this Derringer in the garter tattoo was really creative, and it looks really great. You seem to be able to see that lady who needs protection packing it in times past where no one would be the wiser. 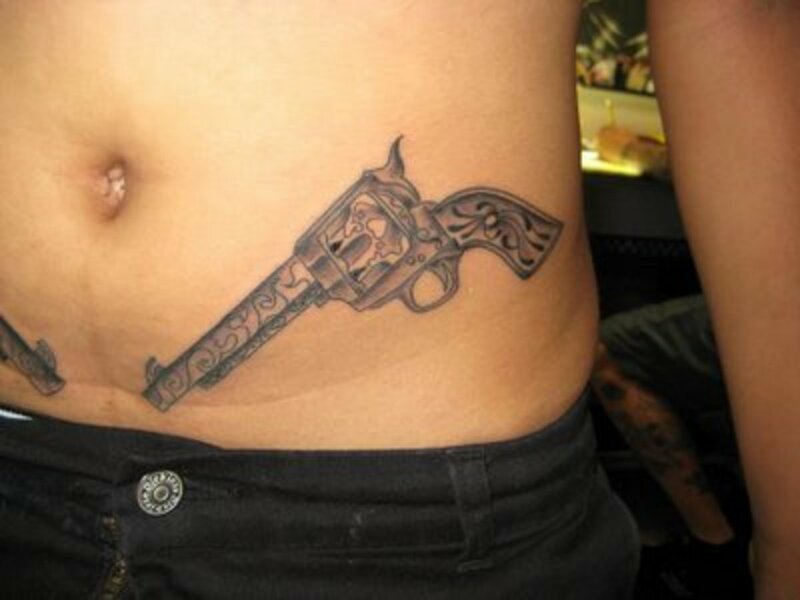 This tattoo with the garter going over the Derringer would be difficult to do, and a good artist obviously worked on it. This Tommy Gun tattoo was among the more unique and best of the gun tattoos I found. It brings us back to the 1930s and 1940s, where this was the gun of choice for many criminals. It is also a symbol of the difficult and tough times lived back in that era. I really like how it is made to appear like someone just had a big battle with it, as the gun is shown to be smoking. The shell casings popping up above also look great. If the Derringer in the garter was cool for the ladies, this gun in the belt look really stands out (no pun intended - hehe) for the guys. What boy or man doesn't remember stuffing a gun down his belt ready to fight off all the bad guys? This captures those moments perfectly. These long barreled revolvers look really nice, and the detail on the revolver is fantastic and of high quality. 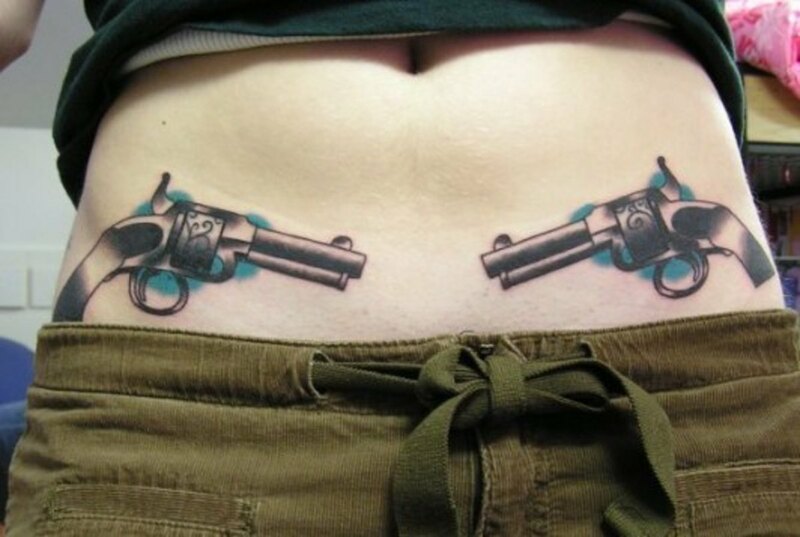 I'm not sure why, but with both the ladies and the guys having two guns on the hips pointing toward one another, or just down, as shown here, was without a doubt the most popular gun tattoo. These revolvers were also very different in look and unique. But again, the pointing slightly down and toward one another was the look people being tattooed with two guns preferred above all other tattoo designs. About the only thing I didn't like about it was the blue background behind the pistols, which just doesn't seem to fit. It's puzzling as to why it's there. This last gun tattoo represents of course a story we've seen, heard or experienced too many times, but it does effectively portray that story and it says it all. The detail is really good with the contrasting light and dark colors, especially with the background of heavenly clouds. Too bad this guy has so many tattoos, as far as the bullet hole tattoos go, as it would have been a really awesome set of tattoos, having a realistic look to them. As they are, they can only be appreciated for what they are individually and not as a whole, because of their being interspersed among the rest of the tattoos. 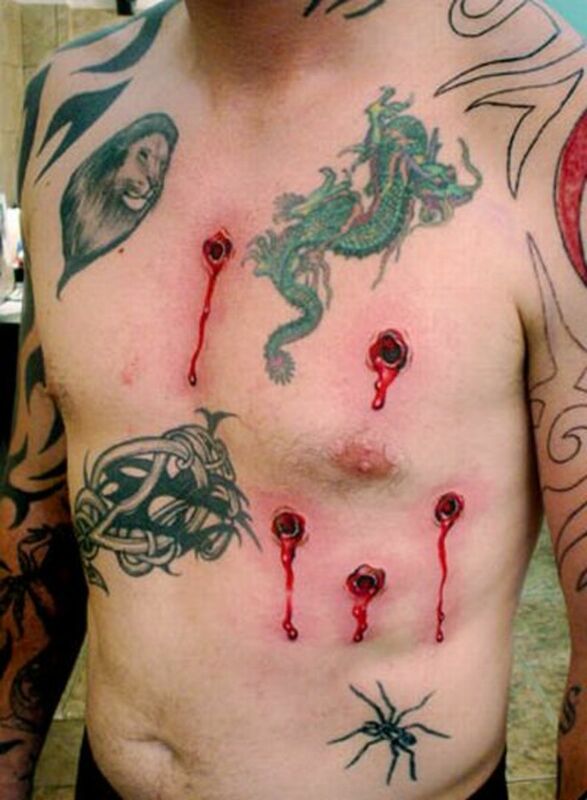 But on their own, you can see how compelling these bullet hole tattoos would be, as they really look cool. 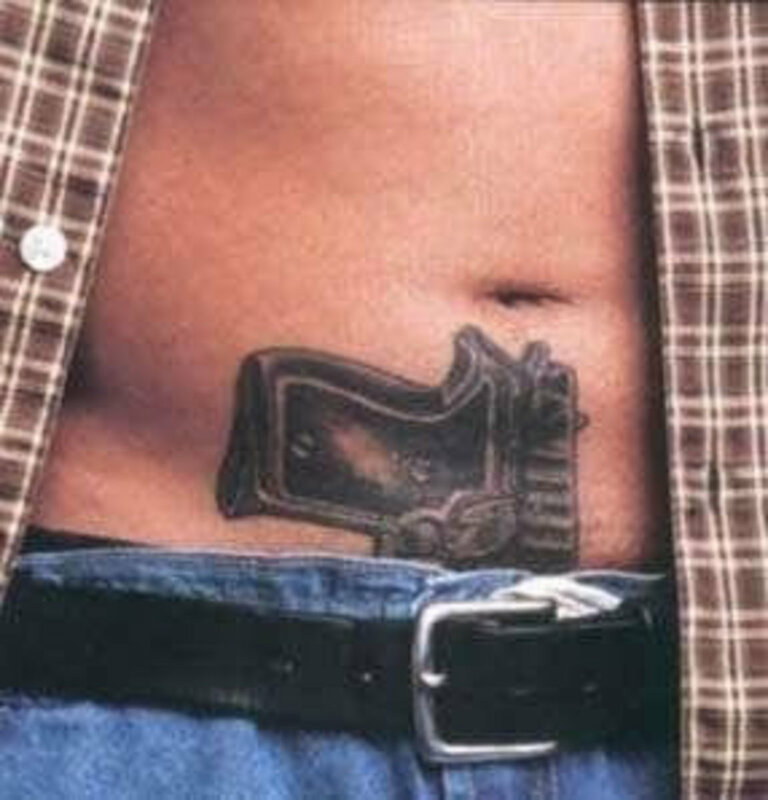 When I started looking for gun tattoos, I really had no idea what I would come up with, but I was really surprised at the quality and uniqueness offered up by the tattoo designers and artists. But those bullet hole tattoos above were apparently the result of all that firepower; the consequence of all those tattoo guns. 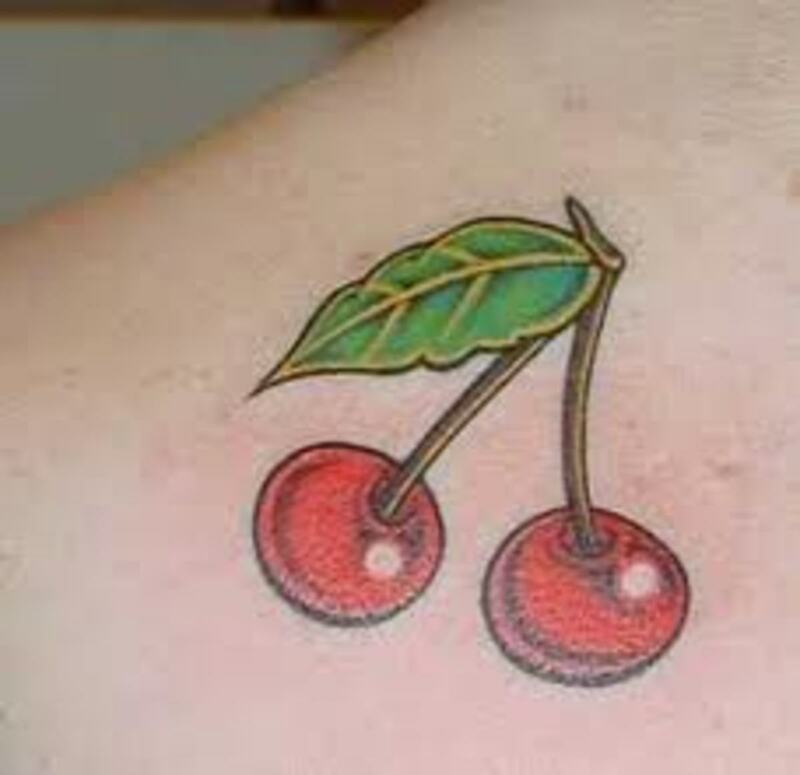 But while they are done well, they really don't go with the rest of the tattoos for me, and take away from them while looking kind of strange without any context to them. They would have looked better with something else as part of the design. 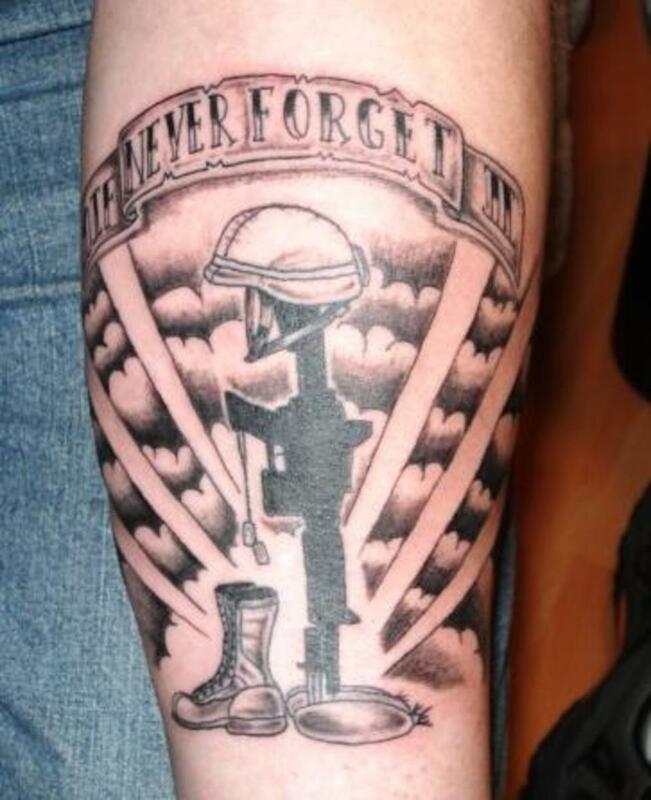 Overall though, gun tattoos are playful and compelling, mostly representing bygone times, but also, in the case of the fallen soldier tattoo, the tragedy and cost of wars..
what do you think of this revolver temporary tattoo?